Coco&Me » Blog Archive » Happy 2011 everyone! I love your Christmas ornaments! But then I also go for the vintage, uncoordinated look… you should see my flat! :D Seriously though, I think it’s much nicer to have things that have a history. For several years after my son was born, all our ornaments were unbreakable plastic or resin ones. When I started buying fragile glass ones a few years ago, I felt so grown-up and excited! Yours look fun and festive. I bet your kids love the tree with all the shiny and fun colors. 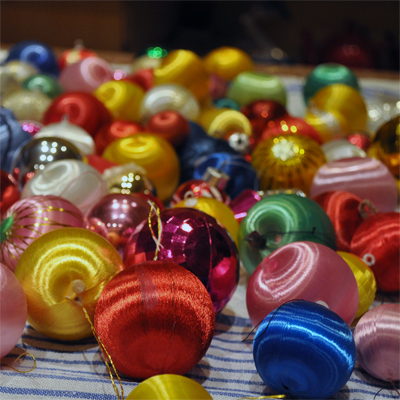 The baubles look a lot like the ones i had at my granny’s place when I was a child… Totally uncoordinated. I did not think about looking for them on ebay, I certainly will when I have a stable home – I just hate buying new decorations! i love bright baubles on a tree, myself. but i’m afraid i agree with your son–the santa head is kind of creepy (of course, i don’t see anything funny about clowns, either ;). i’ve been harassing the daughter to take down the tree for 3 days now, but a bad cold is running through the house & no-one feels like doing anything. i think that our new year is going to start a week late! it is a feeling of ‘farewell to the old’ when the tree leaves the house. our little city picks up the trees curbside & hauls them off to be mulched. Rachel! I bet your place is full of lovely arty things!!! Cocopuff1212, as much as I love the woven silk baubles, I would actually love to purchase more of the tin glass(??) ones, but they shatter so easily… Like you say I’d have to wait a bit longer before I invest in more of those!! Jim!!!!!!! Oh wow! What a lovely surprise to see you commenting here! It’s news to me that you have checked this blog out! Ta! – Sorry to hear that A & K were unwell… Must meet up soon – Iss wanted to go around to yours this afternoon when we passed nearby! Am a sucker for random christmas decos – anything goes on our tree and the more that are handmade or chosen with care the better! Gillian! ^^ random decoration chosen with care…! That sounds lovely! Happy new year Tamami! I like your uncoordinated Christmas tree decoration spirit. Tamami must congratulate you on soldiering on through the snow – whatta gal!! Just looking at your cakes again has convined me I must get down to see you at the stall quick smart!